The late evening passage to Sitka was dreamlike. Apparitions of Tlinget Indian carved canoes came from mists along the somber, haunting coastline inhabited by few humans. Leaving the Mitkof Island town of Petersburg, we would later pass the Russian named islands of Kupreanof, Huiu, Chicagof, Catherine and Kruzof en route to Sitka, located on Alaska's second largest island, Baranof. In the fjord passages from Petersburg to Sitka, the mountains are always near, the channels more narrow than wide. My son, Steen, and I sat aft starboard on the lower deck of Columbia, Alaska's largest maritime ferry. 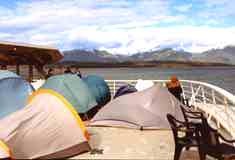 On the two decks above us, many backpackers had their tents set up, taped to the deck and tied to each other. Like my son and I, a few watched the sea. A lone guitarist serenaded the silent inland sea. Near midnight, the low clouds and light drizzle made the sky appear as an ocean of grays and near black blues. Ribbons of mist and fog played with the Tongass temperate rain forest. Two dall porpoises, their orca-like jet-black bodies and snow-white aprons clearly visible, rose in the waveless water. Soon after, we spotted six orca whales, their distinct dorsal fins breaking the surface  the seawater spilling off of them like dim liquid silver in the deep twilight. We sat speechless, marveling in this land of the midnight sun. Traveling Alaska's Inside Passage is a journey every traveler should consider taking at least once in his lifetime. Whether by cruise ship or ferry, it is one of the finest maritime traveling experiences available. ferry, prepares to depart Petersburg I prefer the ferry because it is a more intimate traveling experience, less expensive and allows one to take his vehicle en route. We boarded with a full size van pulling a tent trailer. Alaska ferry travel also allows the adventurer an opportunity to explore smaller ports where cruise ships do not stop. The smaller ferries LeConte and Aurora are generally less crowded, more relaxed, and add an extra dimension to your trip. They are favorites amongst artists, photographers, writers, and the more adventurous. Our Inside Passage journey began in Prince Rupert, British Columbia. You can start in Seattle though, or board in other Southern B.C. ports. No roads connect the Inside Passage of Alaska to the mainland, except in Skagaway, Haines, and Hyder. You must go by either boat or plane. When making ferry reservations (the earlier, the better, if traveling by vehicle), you should have your itinerary planned precisely. We spent a month on the Inside Passage with a one-week stopover in Petersburg. Driving from Southern Oregon, we entered Canada at Summas, B.C.. Via Prince George, we reached Prince Rupert, Canada's northernmost ice-free port and the third-largest naturally deep harbor in the world. 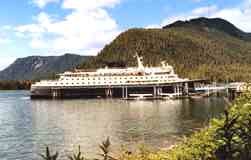 We arranged for a four-bed berth while traveling from Prince Rupert to Petersburg, a 24-hour journey aboard the ferry Malaspina. Like all the larger ferries, the Malaspina has four decks, private sleeping berths, lounges, reading rooms, dining room, showers, and pilot's house. We were always surrounded with outdoor and indoor views of the inland sea and mountains. ferry deck. Cabins are also available. In the late afternoon, the Malaspina had a three-hour stopover in Ketchikan. Ketchikan is the southern most city along the Inside Passage in Southeast Alaska, the point of entry into this enchanting land. It rains 300 days of the year; our bus driver said, and they had two days of sunshine that June. 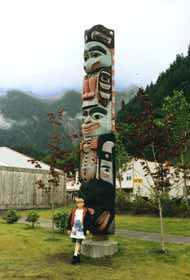 Ketchikan has the largest collection of totems found anywhere in the world. It is a tourist's shopping paradise for native art. Cruising into Petersburg, the ferry passed through the tight Wrangell Narrows. Like the neck of a bottle, the inland sea shrinks, becoming canal-like, requiring higher tides for safe passage. It is an unforgettable sight to see a ship pass through the slim fjord waterways of the Inside Passage. It is like placing an oversized boat in a small bathtub. A typical view, here near Sitka Petersburg's picturesque harbor with its flotilla of fishing boats was shrouded in the deep blue light of early dawn when we arrived. Across Frederick Sound, 10,023-foot Kates Needle and 10,290-foot Mount Ratz were dressed in their perennial, white evening snow gowns. Below Kates Needle and 9,077-foot Devils Thumb, the phosphorescent blue light of Patterson Glacier radiated from the shadows of dawn. Founded by Norwegian Peter Buschmann in 1896, and settled by his fellow countrymen, Petersburg is called the "Little Norway of Alaska." Famous for its shrimp, halibut fishing fleet, and wildlife, it is located on Mitkof Island. 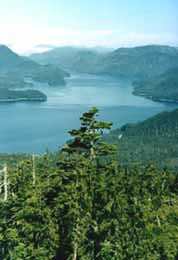 Tongass National Forest, among the largest temperate rain forests on the planet, surrounds Petersburg. The southernmost tidewater glacier in North America, LeConte Glacier, is located across Frederick Sound from Petersburg. Icebergs can be seen floating daily in the sound. During our stay, we saw bald eagles, black bear, otter, martin, porcupine, ducks, great blue heron and a variety of songbirds. The king salmon run was at its peak in Blind River, 20 miles south of Petersburg. With fly and spin equipment, we caught upwards to 40-pounders during our stay. Sitka is the cultural capital of Southeast Alaska. It is here where James Michener stayed to research and write his epic book, Alaska. Sitka is rich with the history of two cultures, witnessed by the Russian architecture, Tlinget Indian totems, Russian and Tlinget folk dance programs, museums, and the sales of arts and crafts from both. A beautiful, small city of 9,000 people, it is surrounded by islands and snow-covered mountains. The Russian Saint Michael's Cathedral, built with original carved doors and decorated with Russian icons, is the downtown focal point. Not far is a picture postcard harbor, home to a sport, tourist, and commercial fishing fleet. Looming nearby is the island of Mount Edgecumbe, Southeast Alaska's only volcano.Wildlife is important to modern day Sitka. The waters near Sitka from mid-September to mid-January are home to as many as 80 humpback whales. Whale Park, a few miles outside of the city limits, has free viewing platforms, picnic tables, and telescopes. The ferry journey from Sitka to Alaska's capital city, Juneau, is approximately eight hours, much of it along the Admiralty Island coastline. We sighted numerous humpback whales along the passage. 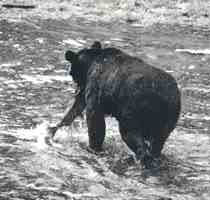 Ninety-five percent of this large island is designated wilderness, home to numerous brown bear and Sitka blacktail deer. Juneau is the major port of call for ships and ferries sailing the Inside Passage. A robust city of 30,000, Juneau has a vast menu of activities. Fine dining, shopping, fishing, river rafting, glacier watching, and excursion tours are among its many offerings. My son and I took the Adventure Bound boat on a daylong trip to Taku Inlet, Tracy Arm, and Sawyer Glacier. It was an enchanting visual journey with breathtaking views of whales, waterfalls, seals, and sea lions basking atop sun drenched icebergs. Rock walls rose precipitously above the rich green inland sea. The ferry or cruise ship journey up Lynn Canal to Haines and Skagway is visually stunning. 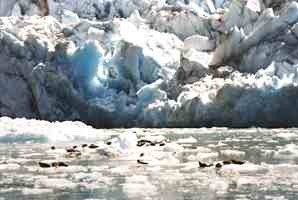 From either town you can access spectacular Glacier Bay National Park and Preserve via boat or plane. Many consider Haines to be Alaska's loveliest town. Backed by the Cathedral Peaks of the Chilkat Mountains, it was the setting for the 1990 movie, White Fang. Bicycling and kayaking are popular summer activities. Ample sunshine and flowers and friendly people make Haines a comfortable fit when visiting. Just outside Haines is the 48,000 acre Alaska Chilkat Bald Eagle Preserve. Chilkat Indian dancers in authentic costumes perform at the Chilkat Center for Arts. and Tlinget totem The Inside Passage ends with a mere one-hour ferry ride up the Taiya Inlet to Skagway, gateway to the Klondike. In the late 1800s, Skagway was built overnight, becoming the main port of call for prospectors heading to the famous goldfields, 500 miles north. 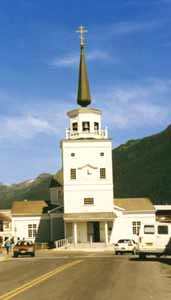 Steeped in history, Skagway still has the charm and robustness of those bygone days. From Haines and Skagway, paved and gravel roads head to the North Country of B.C, Canada; into the Yukon; and over to mainland Alaska. Anchorage is 775 miles further up the Haines Highway. The Klondike Highway from Skagway passes through Whitehorse en route to mainland Alaska. Travelers without vehicles may opt to return to their starting port via the ferry or via air. 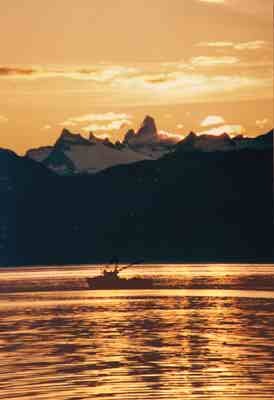 Regardless of how they return, visitors will savor lifetime memories of their incomparable Inside Passage experience.